This will be a talk for the CSI Math Club on October 31, 2013 at 2:30 pm in room 1S-107. Abstract Come and learn how to play and win the game of Nim! The game has two players, faced with several small piles of blocks. Each player, on their turn, can remove one or more blocks from one pile, but only one pile. (Removing a whole pile is fine.) 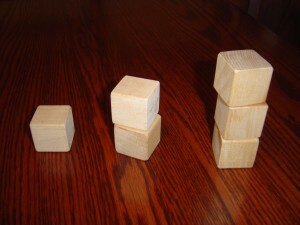 The player who removes the last block wins. This simple-to-describe game is maddening for those who don’t know the secret mathematical winning strategy. Come and learn the mathematical secret that will allow you to win every time against someone who doesn’t know it. This entry was posted in Talks and tagged games, math game, Nim by Joel David Hamkins. Bookmark the permalink. My main open problems in winning strategies of the games is about chess. There is a strong feeling that white has more opportunity to win the game but I don’t know exactly how percent of games in grandmaster class are ended by white as winner. I saw some games that black immolates a valuable piece (for example a Knight or Bishop) in order to take the opportunity of first move. Also personally when I am in black position I prefer to play very defensive and look for opponent’s mistake in order to launch a counterattack. However computationally chess is much more complicated than impartial games like NIM and has an essentially different nature.